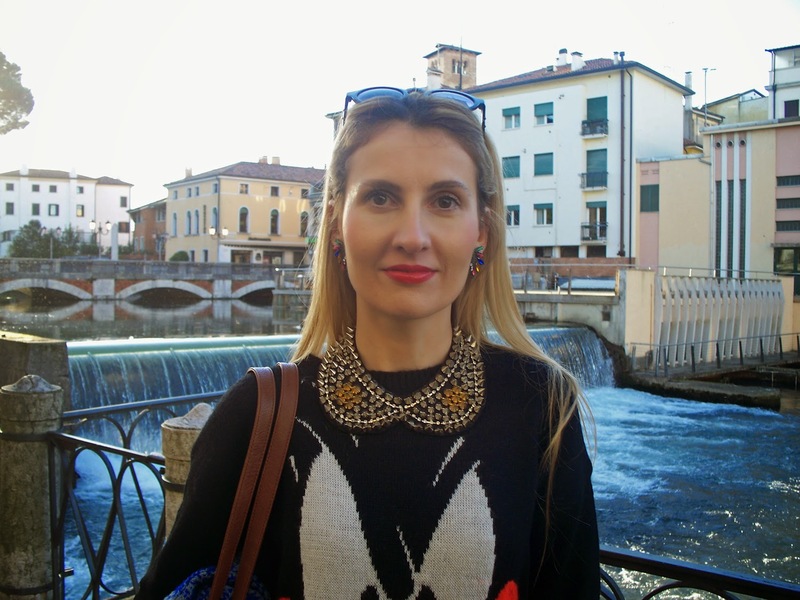 Past week I went to Treviso with my good friend Stefania. We took a train, and even though it wasn't a long ride, it was fun, as I haven't taken the train in ages! 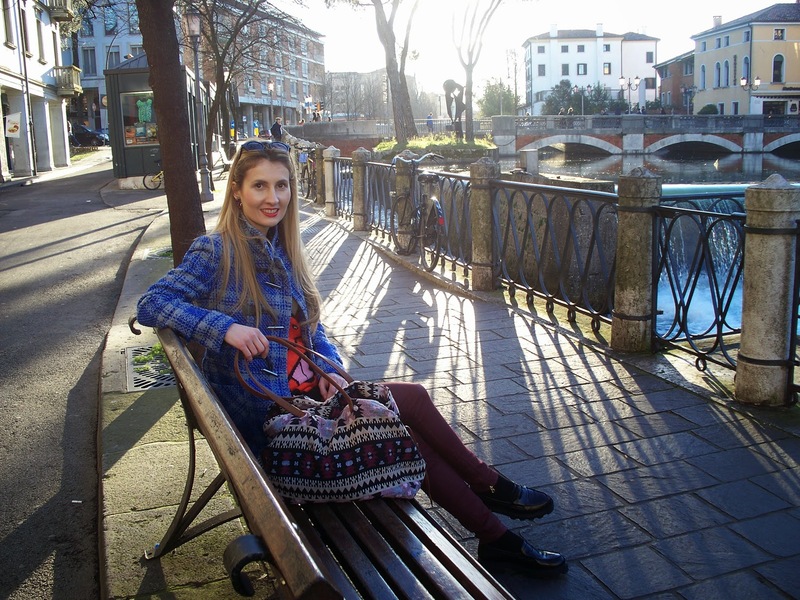 Treviso is such a lovely little town in Italy, in Veneto region! We went there to take a walk, shoot some photos, check out the local stores, and rather new H&M shop. We had 50% off coupon for H&M's new collection, so we were very excited to check out the store! It is a lovely store, situated in an antique building, but unfortunately, I couldn't find anything I was looking for...everything that I wanted was either completely sold out, or sold out in my sizes :-( I ended up getting only one shirt that was already on midseason sales. Both Stefania and I agreed that we'll have to use our coupon elsewhere! For the day of Treviso sightseeing + shopping, I wore my new coat from Benetton Outlet (it seemed only appropriate to wear something Benetton, given the fact that the Benetton family come from Treviso and they practically own it! 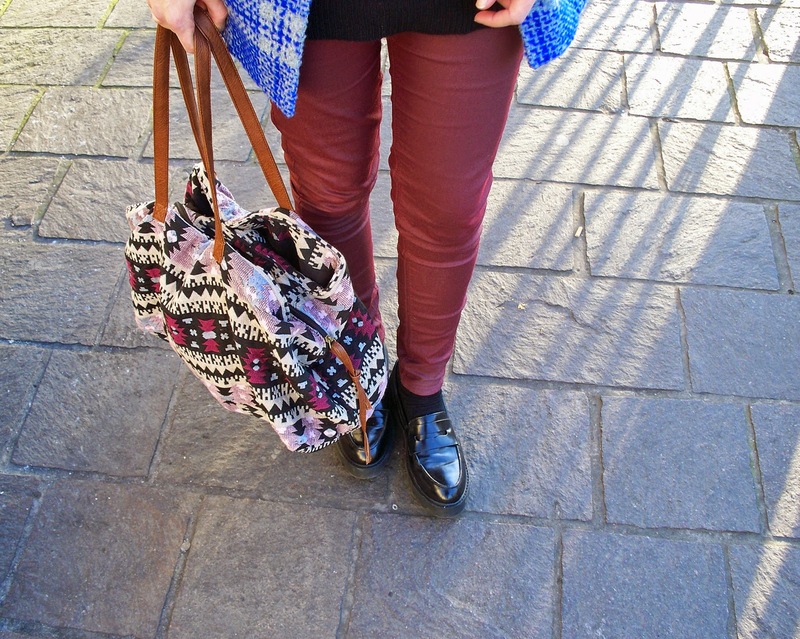 )...my H&M burgundy pants that I already wore in my last post here!, and my comfy, but cool Zara moccasin as we did a lot of walking around the town. My funny Looney Tunes sweater is from Bershka and I picked it up at the end of winter sales for only 4.99€! 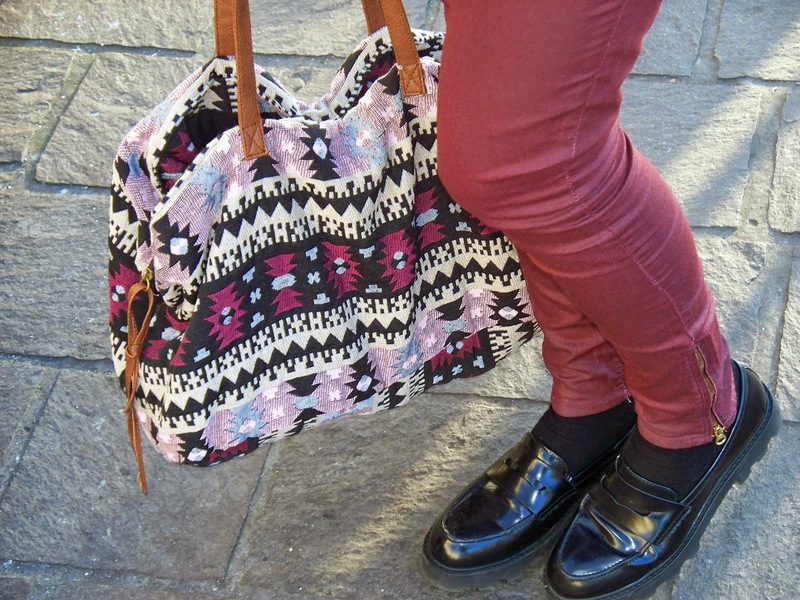 I completed the styling with my Stradivarius bag (also new, from the sales!) and spiked "peter pan" collar necklace, that I've had in my collection for a while, and everytime I wear it I get compliments on it! Prosli tjedan napravila sam mali izlet u Treviso sa prijateljicom Stefaniom. Snimale smo i vlogic, ali jos cete morati pricekati na njega, jer je u fazi editiranja! Isle smo vlakom i iako nije bila duga voznja, bio je to pravi mali dozivljaj, buduci da se vlakom nisam vozila cijelu vjecnost! Treviso je jedan prelijepi mali gradic u talijanskoj regiji Veneto! Buduci da je H&M nedavno otvoren i u Trevisu, radovale smo se posjeti ducanu i kupovini nove kolekcije po snizenim cijenama! H&M kao sam ducan nam se svidio, velik je, smjesten u antiknoj zgradi, vrlo pompozan cak! Stefania i ja smo zakljucile da cemo bon morati iskoristiti u nekom drugom H&M-u! Sto se outfita tice, nosila sam svoj novi Benetton kaputic (Benetton Outlet haul video snimila sam vec na hrvatskom jeziku, moram ga editirati i uploadati, sigurno ce vam se svidjeti, jer nasla sam toliko jeftinih, a predobrih stvarcica)...Buduci da smo isle u Treviso, nositi nesto sa potpisom Benettona cinilo mi se kao logican izbor (haha), (naime familija Benetton dolazi iz Trevisa i prakticki drze grad u svojem vlasnistvu, koliko su bogati i mocni!). Stosna "Looney Tunes" majica je iz Bershke i kupila sam ju na kraju zimskih snizenja za samo 4.99€! Ogrlicu vec duze imam u kolekciji i volim ju jer "podigne" svaki outfit, a uvijek kad ju nosim dobijem puno komplimenata! Love the sweat, so pretty! Fantastic combination. You look amazing, Sonia. That coat is cool! You got a 50% coupon for H&M?! I'm so jealous! Haha, love your outfit! The shoes are also really stylish. Beautiful photos and very cute outfit! New post on the blog, see you soon! Amazing look! I love the the sweater and the coat! I love the top so much! Reminds me of the cartoons I watched back in the day!